I'm having the relaxing weekend on my own with my sewing machine that I'd planned to have. 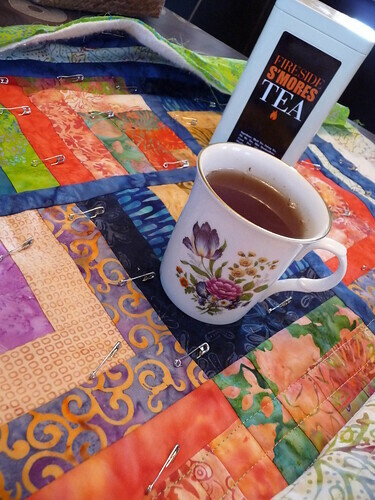 Today I'm enjoying some tea from teacups I inherited from my grandmother while quilting this wall hanging. The weather is so beautiful I've even been able to keep some windows open for fresh air. I'm also watching classic movies on Netflix - some Doris Day, Danny Kaye and Clark Gable. Obviously not all in the same movie. It's been a fantastic weekend, how's yours?